Once, in a hospital, a tech said to me, “If you throw a pity party, nobody comes.” I had just received bad news about my health and lifetime prognosis. I suppose it was her strange way to say, “Buck up, kid.” I have often thought of that hospital tech and her statement to me. It seems that stigma rears its ugly head here. When faced with the fear of another’s anguish, the “buck up” approach may serve to distance and appease an observer’s discomfort. I, too, find it difficult to sit with my own impotence to remediate another’s painful reality. What do we say as we bear witness to the complex expression of sorrow? I suggest saying something other than, “If you throw a pity party, nobody comes.” In fact, I have found this to be profoundly untrue. For me, pity parties have served as a vital survival mechanism in balance with many other mechanisms. In my experience, everyone can bring something to a lamentation party, be their pities “large” or “small” relative to others. Each personal crisis or tragedy is real and vital to s/he who brings it. The problem is not that nobody comes to a pity party. The issue I can see is that not everybody wants to leave it. 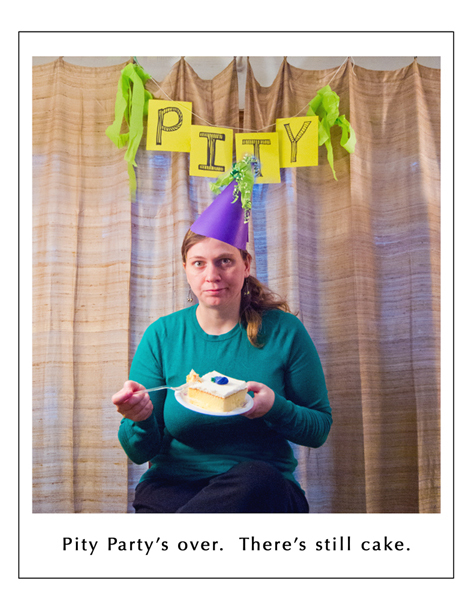 I take a tactical approach to the concept of “pity parties.” I have developed kits for hosting the perfect, time-limited pity party, with guidelines, custom tissues, and decorations. Perhaps a piñata? I am up for suggestions. But of course, there’s cake.